Despite having been wearing my pyjamas all day (what? There was nothing in my diary for today), I seem to have got so much done. I love days like this – about five major things checked off my to do list, plus I even had time to make these gorgeous pot pie / pasty hybrids (more on those in a minute). You can tell I’m getting old and boring – one of the most exciting things I’ve done today was order envelopes for our wedding invitations. I know it’s wedding related, which is exciting, but still… envelopes. I don’t think I’ve ever been excited about envelopes before. I love having productive days. I definitely have my fair share of days where all I want to do is laze around moping, but every now and then something clicks into place in my brain and I enter Wonder Woman mode. Letters get posted, rooms get tidied, emails get sent, laundry gets washed… serious medal-earning material. Anyway, these pie things. I wasn’t entirely sure what to call them – they’re ‘designed’ around a typical veggie pot pie filling, but I think the fact that they’re not cooked in a pot kind of means I shouldn’t have called them pot pie pasties. 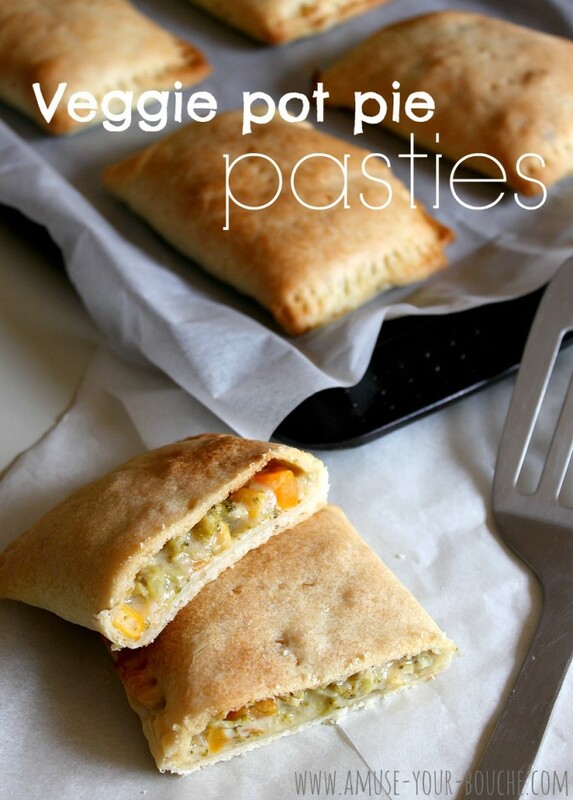 But just plain ‘veggie pasties’ sounded so boring, so I hope you’ll forgive the technical inaccuracy. The point is, they have all the flavours of your favourite vegetable pot pie, but with the added benefit of being able to pick them up and eat them with your hands, which is always a plus for me. Plus they’re far easier to pack up for a picnic or lunchbox. They can be eaten cold, although I preferred them with a little warmth in them (not piping hot). If you’d rather not eat all this pastry, fear not – although pastry is quite possibly the best thing ever, you can still get all these flavours if you make my veggie pot pie soup instead (and considering that that soup was in no way a ‘pie’ and I still called it ‘pot pie soup’, I think I’ll let myself off the name of this one). The two recipes basically begin in the same way, except where the soup recipe ends, this time we add pastry. I’m sure you can guess which one I’d prefer but you can decide for yourselves. By the way, if you do try to make these, don’t panic if they look a complete mess before you put them in the oven. The first one that I filled and shaped was a disaster – the pastry stuck to my un-floured worktop and when I tried to move it over to the baking tray I made a hole in it and the filling all started going everywhere. However, once it was baked, it looked far better. These little babies are pretty forgiving! 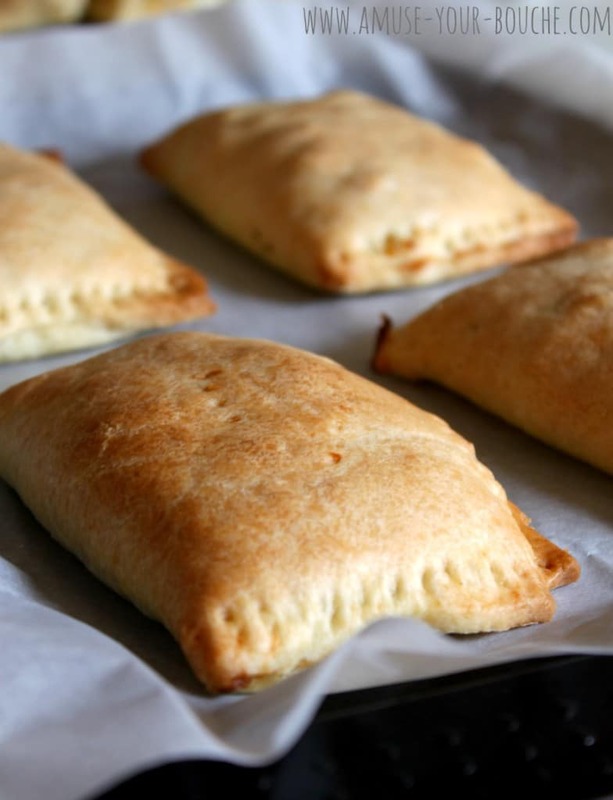 As long as you can get the filling wrapped in the pastry, you’re good to go – though I do recommend using quite a lot of flour when rolling out your pastry, and maybe even constructing your pasties straight onto the baking tray, just so you can be sure to avoid your own mini disaster. Anyway, I shall stop waffling now (all this productivity is making me think in double time) and leave you with the recipe. It might look long, but don’t be put off! It’s not particularly tricky. Cut the onion and carrot into small dice, and mince the garlic. Cut the broccoli into small florets (you can also cut up some of the stalk if you like, although I found that just the florets themselves were enough). Heat the oil in a large frying pan, and cook the vegetables over a medium-low heat for 5 minutes, stirring regularly. Add the stock, corn and oregano, and cover the pan. Leave to simmer, stirring occasionally, for another 5-10 minutes until the vegetables are fairly soft (they will cook a little more in the oven so it doesn’t matter if there is still a slight crunch). Meanwhile, melt the butter in a saucepan, and add the flour. Cook over a very low heat, stirring constantly, for 1-2 minutes to cook the flour. Add the milk a dash at a time, whisking continually to create a smooth mixture each time before adding more. When all the milk has been added and the mixture is smooth, add a pinch of nutmeg and the vegetable mixture. Mix well to combine and season to taste. If the mixture looks a little wet, simmer it gently, stirring often, for a while until it thickens to the desired consistency – you want it to be saucy, but you should be able to dollop it without it spreading out too much (a little spread is fine!). If the mixture looks too dry, just add a dash more water or milk. Roll out the shortcrust pastry (I find that ready-rolled pastry is usually a little too thick – it only needs to be about 3mm thick) on a well-floured surface, and cut into 6 rectangles measuring approximately 15x10cm. When the filling mixture is at the desired consistency, scoop around 2 tablespoons onto one of the pastry rectangles – just to one side of the centre. Fold the pastry in half over the filling, and seal with a small amount of milk (I find it easiest to pour a tiny bit of milk into a ramekin, and then just dip my finger in it and use my finger to wet the edge of the pastry). Use a fork to press around the edge to seal the parcel further. Carefully transfer the pasty to a lined baking tray (alternatively, you can construct your pasties straight onto the tray – this is easier, but you will probably need to overlap them before you fold them, so it takes a bit more organisation). Repeat with the remaining 5 rectangles of pastry. Prick each pasty once or twice on top with a fork. Bake in the oven for around 30 minutes, until golden brown. Transfer to a rack to cool, or eat immediately (I preferred them after they’d cooled for just 10-15 minutes or so). These were so good. I made them vegan with vegan butter and almond milk + vegan homemade shortcrust (I used NYT recipe and subbed in vegan butter), so vegans and lactose intolerant people, these work for you, too! I froze some before I cooked them and they taste just as good. Thanks so much for this amazing recipe! Thanks, glad you liked them! :) Hope the frozen one works out okay, make sure you report back! These were delicious! I loved them! I know diddly squat about baking anything and only a bit about cooking so sorry if this is a dumb question. Can you use soy or almond milk instead to make the filling? Is vegan butter a good substitute for the filling (ir is there anything you can recommend)? Can I seal the pastry with water or soy/almond milk? Thank you so much for publishing these recipes!I love how simple most of them are, and how delicious! Would these be good to make and freeze to eat throughout the week? I’ve been trying to find recipes like this to make for my husband to take to work all week. Hi Amanda :) to be honest I don’t really freeze much food so I can’t say for sure, but I don’t see why not. Perhaps you could start out by just freezing one to test how well it works? I’ve got tesco ready rolled short crust pastry for making these tonight. 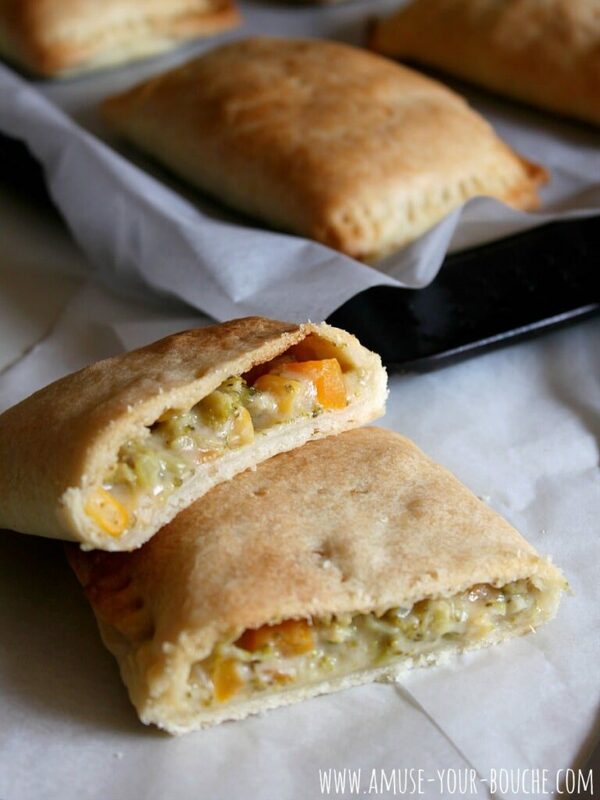 oooh they remind me of the Amy’s brand pot pie pockets! 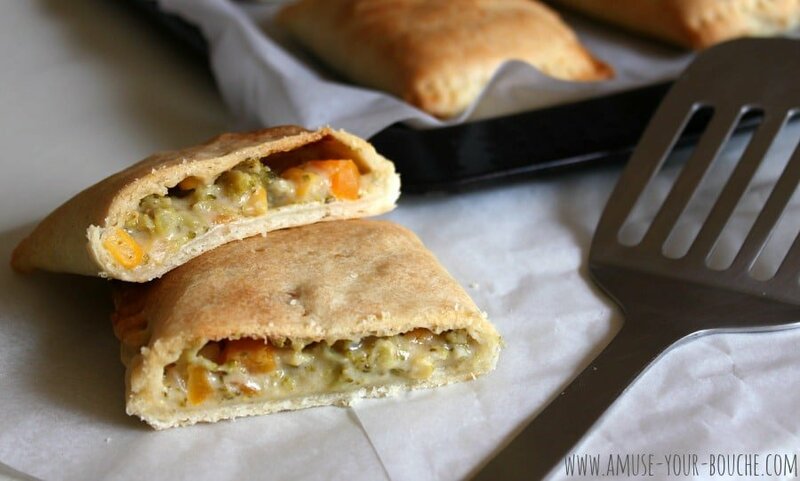 Veggie pot pie pasties! You are endlessly inventive and joyous with your food creations. Oh, how I wish I’d seen these last week! I spent last week eating only meatless meals and I have to say, I was a little hungry during the time of change. These would have filled me up. I think I’m going to make them tonight for dinner, they look delicious! Pot pies are perfect. I make a version of these for the my boys lunches and they love it. It’s easy and very fancy for parties too. Can’t beat a good pastie! These look fab! I get fed up of plain old cheese and onion ones! Mmm I love pot pies, love that you made these little hand held versions. They look delicious!